Some gifts are made for the recipient. 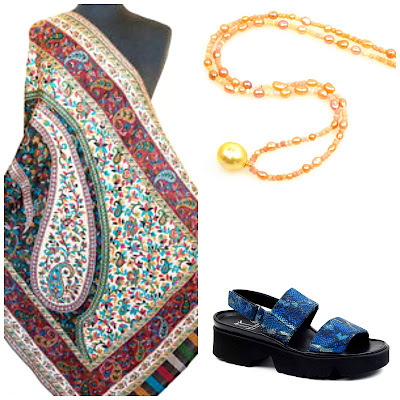 Here's a selection from modest to extravagant to celebrate your singular person. These are not last-minute gifts, but there's still time for Christmas, or for winter birthdays. 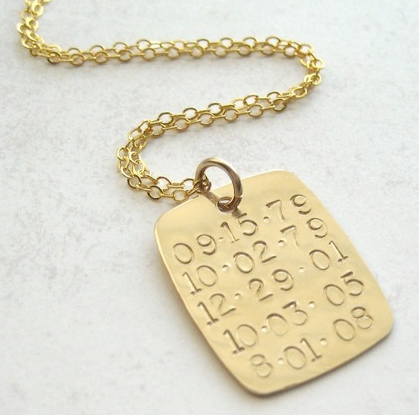 If unlike Angelina Jolie one is unwilling to tattoo the dates and longitude of each child's births (or any other events) on one's body, Etsy seller amycornwell makes perhaps the ultimate personalized gift, a dogtag necklace inscribed with up to five dates of significant events, or a combination of date(s) and a phrase. $34 for a 1"x 13/4" gold filled or sterling silver tag. 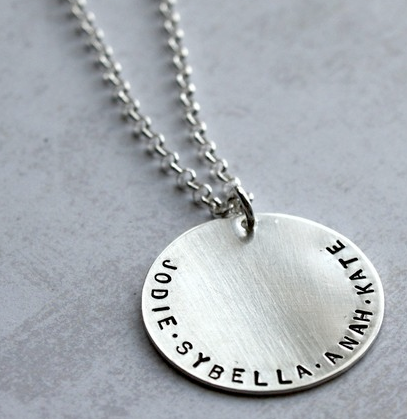 She also makes this st erling silver mega necklace (1" round) that allows you to wear your words for a most reasonable $25 (chain included). unusual, completely personal piece. $250 from Ross-Simons. Engraved letter sheets from Crane & Co. lend warmth and elegance to correspondence. 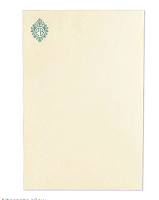 Shown, Ecru white engraved letter sheets, $186 for 25. Matching envelopes are also available. An intarsia cashmere monogrammed pillow strikes me as the ultimate gift for a parent's wedding anniversary, or your favourite uncle's 75th birthday. Made by Scotland's Z. Hinchcliff and Sons, with 125 colours from which to choose to create your heirloom gift. $430 from North River Outfitter. 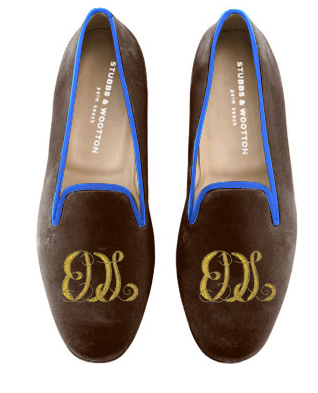 Stubbs & Wootton needlepoint slippers have always seemed twee to me but they have passionate adherents, and their bespoke monogrammed option ($900) could deeply please someone inclined to clubby luxe. The Pink Monogram sell a $170 version; delivery takes up to 16 weeks. A personalized leather-bound journal is a versatile gift that can commemorate a trip or creative venture. This journal with lined pages is $130 from Jenni Bick, and $12 for each line of embossing, up to two lines. Those who resist flashing a monogram absolutely roll over for pets. 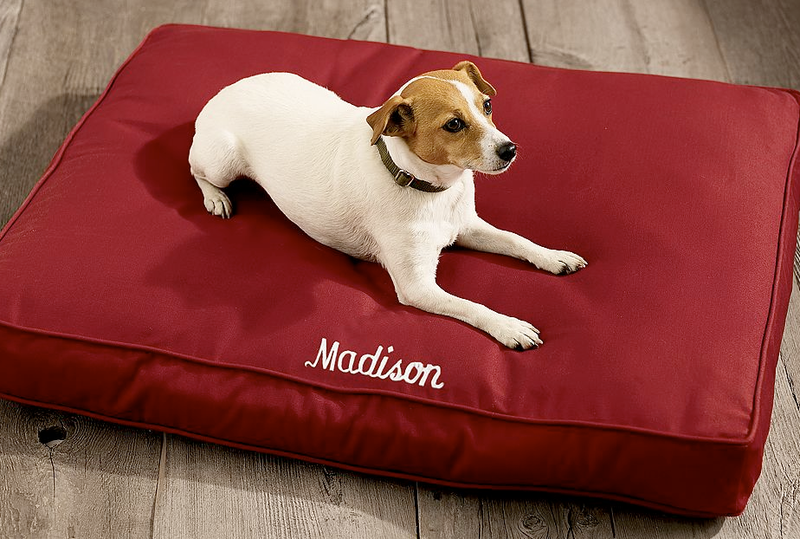 Pottery Barn sell personalized dog bed covers in small, medium and large for $49-$69; bed insert sold separately. 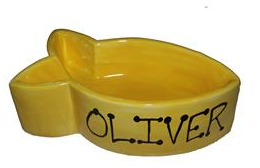 Feline family members might sidle up to a personalized fish-shaped cat food bowl, $24.99 from My Pampered Pet Gifts. 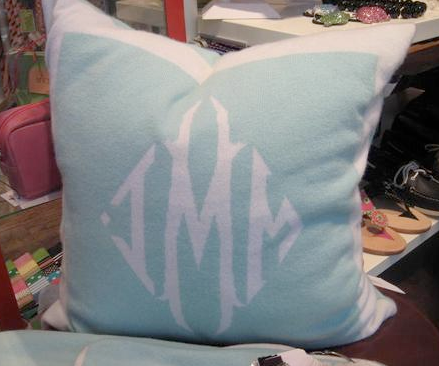 I love these monogramed gift ideas, especially the shoes. Love every single one and can imagine many friends and family members who would as well. An idea for a child's gift, in keeping with your theme -- I had a rubber stamp cut with my daughter's name spelled out and gave it to her (with a stamp pad, of course, when she was 4 or 5, just beginning to read). Of course, it's much more difficult to find the kind of stationery shop I ordered it from, but I suppose Staples or whatever must still take orders for personalized rubber stamps. What I'd like is some nice velvet slippers (perhaps mules, but not too open) with a bit of a heel - a wedge or a low but noiseless heel, so they aren't too schlumpy. Thinking of the kind of slipper that can be worn at certain types of parties - not truly formal of course but still pretty. (Remember, we have to take our @#$%?&* winter boots off at the door). Renzo eats out of café-au-lait bowls. I will of course share a bit of the smoked salmon with him, though doubt too much is good for cats. Metscan, perhaps your dogs might like polar fleece blankets folded over a couple of times? My cat adores a small one, and it is so easy to launder - I have friends with dogs who say the same, but none of their dogs are as large as yours. These are great ideas, not your run-of-the-mill monogrammed items. I want that ring for myself, though. 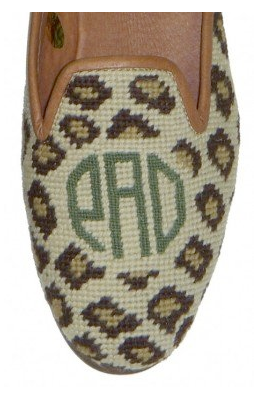 The Pink Monogram's needle point loafers are fabulous!!!! I'd opt for the floral on chocolate, the goldens, the horses or the bulldogs. 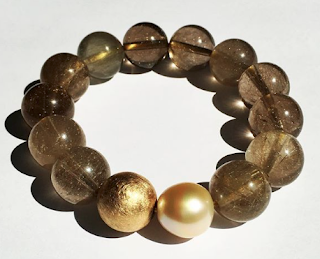 How fun to wear these with ankle pants and a white shirt with big gold earrings or hoops! I love stuff like this because NO ONE walks around wearing them. That makes YOU an instant standout. Yet, in essence, they are nothing to fear; they are simply classic loafers. 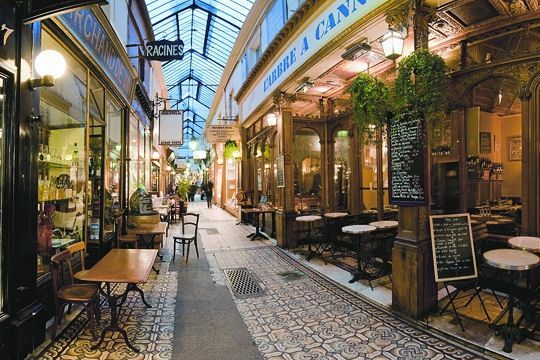 I hope I see something like this in Hong Kong. Anonymous: Don't use my blog to link to your crappy products. No time to shop? Caramel to the rescue!